Ever seen a motivational speaker? Or a well-versed politician? Or just someone you know who can command a room with no problem at all? It’s hard to put your finger on what presence is, but part of it is making people want to listen to you. Presence also means students are feeling safe with you and your ability to manage a classroom. They trust that you are teaching them something they should know and that you are the expert (even if you aren’t). It’s creating a positive space that students will inevitably thrive and learn in. In other words, your presence can make or break student’s learning. How Can I Refine My Presence? There are a few core skills that you can use to enhance your classroom presence. These techniques and strategies will improve the way you command a classroom. If you’re a parent or you’ve worked with children before, you probably already know a lot about how the inflection of your voice can command presence in a room (and no, we don’t mean yelling). As a teacher, you’ll need different types of voices to garner different responses from your students. Use a firm voice to grab attention in the classroom—think deepening your voice and calmly stating your requirements. Deeper voices demonstrate you’re grounded and authoritative. Use a softer, comforting voice to denote you care or want to help. These are examples you can use in the classroom today. Keeping your voice steady and calm, with an even pace is equally as important. Not only will it project that you are in fact calm, but it will also make it easier for students to understand you, especially during instruction. If you have something more important than normal and you want to drive the point home, slow down the rhythm of your voice. One of the most important factors in classroom presence is body language. Entering a room slouched, looking down or even arms crossed, scowling all have adverse effects on students. Before you start a lesson, think about how you want to stand. Study confident speakers and how they begin their speeches. Learn what body language works and what doesn’t. The way you begin will make a lasting impression on students and can make or break their respect for you. Stand tall but remain relaxed. While speaking, walk around the room—this helps with nerves, too. If it’s your first time with the class or maybe your first time in a classroom at all, smile. Smiling can help connect you to students which is incredibly important. And lastly, make eye contact. The power of moving your eyes around the room from student to student can’t be measured and will greatly improve your presence. We don’t mean professional speakers—we mean experienced teachers and substitute teachers! Ask a fellow teacher or the school administrator if you can sit in on a class and observe what techniques teachers use. Take note of what’s impactful and how students react to certain techniques rather than others. Doing this will help you take a deeper look into your style and make any necessary tweaks. Try to do this at the beginning of your substitute teaching career to hit the nail on the head sooner, rather than later, or if you’re a seasoned pro who may need a bit of advice, no time is better than now. 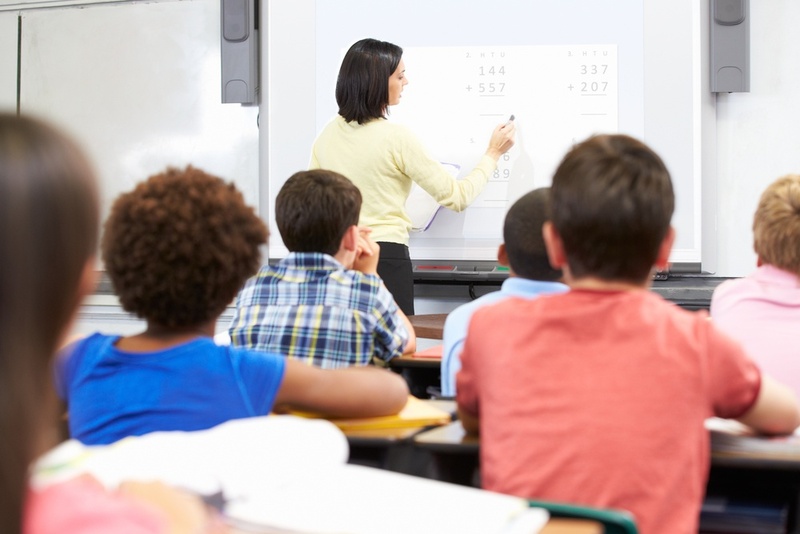 Just like anything else, honing in on your classroom presence and sharpening those skills requires time, practice and experience, but with a few tips like these, you’ll feel more confident and command the classroom like a tenured teacher in no time. If you’re interested in becoming a substitute teacher, contact the Substitute Teacher Service. We can get you started doing what you love because becoming a substitute teacher is easier than you think!